Cultural Fusion: Look out for a fresh take on mainstream styles through a fusion of multiple cultures, and collaborations of vibrant and fierce patterns, artisanal methods and colours. Fresh and Fair Trading: Watch out for fair trade practices that impact the lives of socially excluded groups in developing regions of the world through regular employment, fair wages, and safe working environment. Eco-consciousness: Go for eco-friendly materials – such as non-violent silk, cruelty-free leather, and recycled metal for jewellery. “Communicating the successes and failures of the business is a core part of what The Midcounties Co-operative seeks to do. “In the last month we’ve grown to a billion-pound business,” explains Simmons. “And it’s great that we can celebrate this with all our colleagues. But in the past where there have been downtimes we have stuck to being transparent. Everyone has the right to know how we’re really doing,” she adds. Ed Mayo, secretary general of Co-operatives UK, the UK trade association for co-operatives, said: “We’ve seen that tribes are very important in the consumer world, and it’s the same in the workplace. The workplace is fundamental to our lives. As the tragedy in the factory collapse in Bangladesh continues to unravel – we have to continue to understand the lessons we have learned. The collapse killed more than 1400 workers, injured countless others and came at the heels of a fire in another factory last year that killed 112 workers in the same country. Brands such as H&M, Zara, Espirit, Lee, Wrangler, Nike, J.C. Penny, Wal-Mart and Joe Fresh have been called out for their role on contracting work in such unsafe working conditions. As consumers, it was hard for us to connect such brands to such conditions but the truth is unavoidable. This is a turning point for us as entrepreneurs, consumers and members of our global society. The trends need to change – fast fashion doesn’t work. Inexpensive “fast” fashion comes at the risk of workers in developing countries such as Bangladesh. While some people can only afford “fast fashion”, there are many things we can do as consumers to counteract the dangers of this trend. We need to consider alternatives to disposing clothes such as donating, refashioning, or repurposing clothes. Also, we should consider buy less clothes at higher prices (that are ethically made) or even affordable brands such as Shopnthropic. 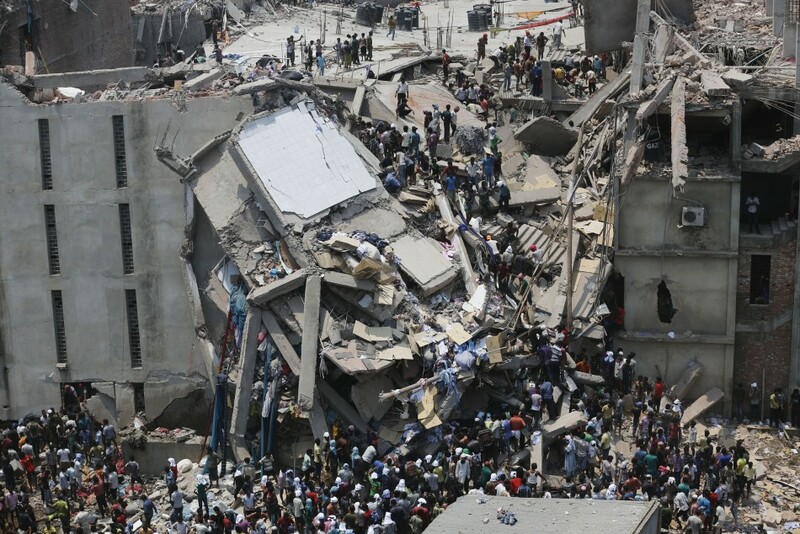 While the world continues to understand the implications and lessons that the tragedy in Bangladesh has bought forth when it comes to the “fast fashion” trend vs. ethical fashion, we have found numerous interesting articles on the topic. Read more about ethical fashion and how many main stream stores rate in terms of their ethical viability:http://www.guardian.co.uk/fashion/2013/may/17/ethical-shopping-high-street-fashion. “If McDonald’s can empower millions of franchise employees to make millions of perfect Big Macs a week, can a social enterprise empower hundreds of thousands to provide basic health care or education to their communities? Cultural Fusion: Look out for a fresh take on mainstream styles through a fusion of multiple cultures and collaborations of eco-friendly fabrics, textures, artisanal methods and colours. Fresh and Fair Trading: Watch out for fair trade practices that impact the lives of socially excluded groups in developing regions of the world through regular employment, fair wages, and safe working environment. Bold Prints: Vibrant and fierce patterns that are inspired by the regions in which they are developed in will be showing up everywhere! A video featuring Vivienne Westwood and Juergen Teller, made by Yoox in association with the UN agency, the ITC. “The issue for consumers who want to buy goods without exploiting foreign workers is that it’s often very difficult to figure out where a piece of clothing came from and how it was made. Buying a major brand or shopping at a well-known store chain, for example, is no guarantee that the item wasn’t made under questionable working conditions. Villasenor says large retailers such as Wal-mart or Sears either work with a distributor, which in turn finds manufacturers to produce an item, or else they deal with the manufacturer directly. Working with a distributor could mean less oversight of conditions on the factory floor. A strikingly low price on an item of clothing might suggest that it’s the product of sweatshop labour, but it’s not a precise indicator, says Villasenor. She says there are “many, many conditions” that could lead a store to settle on a sale price. “It really depends on the margins the retailer decided to put on that garment,” she says. Consumers worried about sweatshop labour should inspect the name of the country printed on the label, says Cheryl Hotchkiss, senior manager of advocacy and public engagement at World Vision Canada. If the name of a country such as Bangladesh appears on the label, “I think you have reason to be concerned,” says Hotchkiss. But Villasenor points out that this, too, is an imperfect gauge. A label will only specify the country of origin, but not whether the product may have involved an unscrupulous factory owner or distributor.